Need Chop Saw wheels and blades? Make sure you have the right chop saw blades. Whether you're cutting rebar, steel, or aluminum, there is a special blade our there for your chop saw. Don't make a mistake and use the wrong blade. We carry names like Dewalt and Pferd so you know you are getting a quality blade. We have a incredible inventory for every trade! Limited Time Special Offer! Options: Buy 5 Wheels for $22.50 at only $4.50 each Buy 10 Wheels for $42.50 at only $4.25 each Buy 20 Wheels for $80.00 at only $4.00 each DW8001 Features: High performance aluminum oxide grain for long life and fast cutting High grain concentration for agressive cutting action and smoother running wheels Proprietary material mix ens.. Features: Designed to use with DW872 or other 14" dry cut saws Modified ATB tooth geometry provides clean, burr-free cuts Carbide coating provides long life in metal cutting Tri-foil braze absorbs stress, making the tip stronger Expansion slots dissipate heat which extends blade life .. Features: 12% titanium carbide provides long life in metal cutting Modified ATB tooth geometry provides clean, burr-free cuts Tri-foil braze absorbs stress, making the tip stronger Expansion slots dissipate heat which extends blade life .. 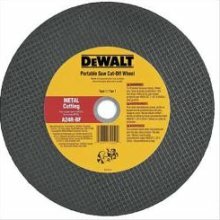 Features: Diamond Edge provides 100x the life vs standard DEWALT chop saw wheel Advanced Brazing Technology cuts metal with the speed of a conventional abrasive blade Steel Blade Cores provides constant cutting depth, capcity and stability of a sold core Exposed Diamond Matrix allows the blade to cut concrete, plastic, fiberglass, rubbber, non-ferrous metals and other soft mater.. Features: High performance aluminum oxide grain for long life and fast cutting High grain concentration for agressive cutting action and smoother running wheels Proprietary material mix ensures durable long life wheels 2 full sheets of fiberglass for durability and safety .. Thicker fiberglass to withstand extreme applications and hold up to high speed saws Specially formulated to provide fast, free cutting and good life Premium grain for added wheel life and speed High quality resin bonds that are 100% inspected before use for product consistency and quality .. Double reinforced with two full sheets of fiberglass for safety and performance Premium grain for added wheel life and speed Enhanced formulations provide longer life and optimal performance High quality resin bonds that are 100% inspected before use for product consistency and quality ..
High performance aluminum oxide grain for long life and high material removal. High grain concentration for agressive cutting action and smoother running wheels. 2 full sheets of thicker fiberglass to withstand extreme applications and hold up to high speeds. Durable hard working high speed cutting blades, quickly cuts rebar, pipe, sheet metal, structrual steel and stainless. ..
14" MASONRY CHOP SAW BLADESilicon carbide masonry cutting bladeUse for masonry cutting applications1" arbor hole7/64" thicknessFor use with low horsepower cut-off machinesMaximum RPM 4365SIZE:14"..
METAL CUTTING CHOP SAW BLADEStandard aluminum oxide blade is perfect for -cutting metal studs, rebar, angle iron & tubingUse on low horsepower portable cut-off machines14" diameter x 7/64" thickness - 1" arbor holeMaximum 4365 RPMSIZE:14"DESC:BX of 5 Blades..
METAL CUTTING CHOP SAW BLADEStandard aluminum oxide blade is perfect for -cutting metal studs, rebar, angle iron & tubingUse on low horsepower portable cut-off machines14" diameter x 7/64" thickness - 1" arbor holeMaximum 4365 RPMSIZE:14"DESC:Sold by Each..
CIRCULAR SAW MASONRY CUT-OFF BLADEStandard silicone carbide grit delivers good -performance cutting brick, block, concrete -or other masonry materials1/8" thickness cut-off blades5/8" round arbor with diamond knockoutSIZE:8" DiameterDESC:7640 Max. RPM..
CIRCULAR SAW METAL CUT-OFF BLADEStandard grade aluminum oxide grit delivers -good performance & life cutting metal1/8" thickness cut-off blades5/8" round arbor with diamond knockoutSIZE:8" DiameterDESC:7640 Max. RPM..
10" MASONRY CUTTING BLADESilicon carbide grit for masonry cutting usesUse with higher horsepower power cut-off -stationary saws on concrete & masonry material10" diameter x 3/32" thickness5/8" round arbor6110 maximum RPMSIZE:10" x 3/32"..
10" METAL CUTTING SAW BLADEDelivers great performance & life cutting with -high horsepower cut-off stationary saws10" diameter with 3/32" thickness5/8" arbor6110 maximum RPMSIZE:10" x 3/32"..